Nevertheless, our research suggests that Hollywood is leaving money on the table — and is in turn failing to address a root cause of piracy — by preserving its separate release windows. Based on our analysis of seven large nations, we find that in most countries, every week customers have to wait before they can buy a DVD translates into, on average, 1.8 percent lower DVD sales. Given that good-quality pirated versions are available close to 14 weeks before the legal versions, the losses can be in the millions of dollars. Not surprisingly, a 14-week delay also translates to a 70 percent increase in pirated movie downloads in those countries. 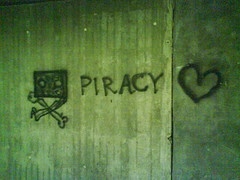 Now, I've posted about piracy once or twice, and this fits with what I've seen. In my experience, a lot of people only turn to piracy when no one will sell what they want to buy. That's pretty much what these professors found in their research. But while I already knew what the paper would say, it's good to have peer-reviewed paper written by a couple of PhDs to back me up. Piracy is first and foremost a force of nature; it is an unavoidable aspect of the way digital content is created and can no more be stopped than you ca turn back the tide. In fact, you'd probably have to kill the internet to slow it down any (that's where SOPA comes in), but even then you're not going to stop it. Together these results suggest that delaying content in the presence of digital channels is likely to cause consumers to lose interest in the product at best, and lead consumers to alternate pirated channels at worst. A better strategy would be to do the opposite: Make it easier for consumers to buy the content in physical and electronic channels. For motion picture studios this might mean selling content in theaters, on DVD and on digital services at around the same time, perhaps at different price points. That also fits with what I've heard and read. Consumers are used to getting something now, and the source matters less than how fast they can get it. Now, you can turn away in disgust, or you can face the truth. When a legitimate alternative is offered in place of the pirated content, piracy goes down. But again, that's nothing new. Any number of people have already said that. Agreed, Netflix was the best deterrent, in my opinion, against piracy. However, instead of embracing Netflix, it seems everyone seems determined to kill it. Hollywood needs to also face, few people care to collect CD’s anymore.. Especially of movies they’ll watch once or twice every five years.. True, but there’s more. Big Software companies preffers tolerate piracy than let the public know that THERE IS A LEGITIMATE ALTERNATIVE: Free Software.